After decades of failed government policies, from James Earl Carter, Jr. (Jimmy), to Barack Hussein Obama, II (Barry), it appears that policy makers haven’t learned a thing. After pouring billions of taxpayer dollars down the drain to fix the credit crisis, over a year has passed, and the problem isn’t fixed. While Obama and his minions now focus on controlling the Big financial institutions, the little guys, like the ones in your community are failing at the rate of one every other day. And what is Obama’s solution to the destruction of capital occurring in our communities? To Add more than $10 trillion to the National Debt over the next 10 years, thus hogging up capital badly needed by community banks, and leading to higher interest rates. To dole out $8,000, and $6,500 refundable home buyer tax credits, not realizing that it’s actually very difficult to get a home loan from failing banks. Not to mention impossible for the 10-20% of the workforce who are unemployed. To extend unemployment benefits, which doesn’t lead to job creation. To sit back, give an occasional pep rally to his constituency, make deals with America’s enemies, and alienate fellow Americans who have the solution. In other words, he doesn’t have a solution. 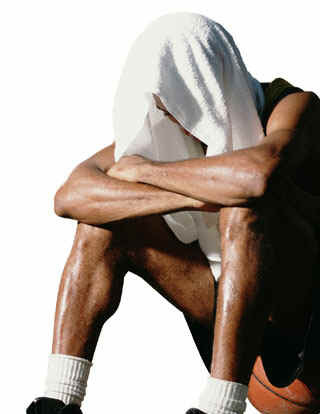 The only solution that a problem can have is to eliminate itself. Obama and his big government, ‘welfare state’ philosophy is the current problem. The only solution is to eliminate the problem. Everyday that Obama borrows and spends, borrows and spends, borrows and spends, pushes us that much farther from a solution, and thrusts us deeper and deeper into the problem. 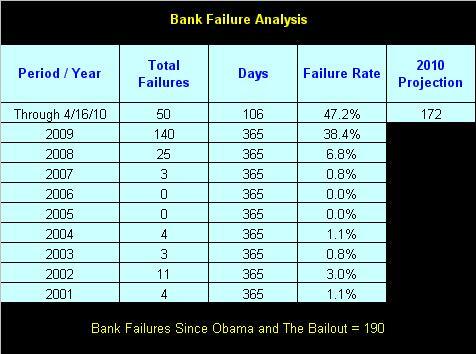 Through April 16, 2010, there have been 50 bank failures. That’s 50 in 106 days, or a failure rate of 47.2%. In 2009 there were 140 bank failures at a failure rate of 38.4%. So it’s been more than a year since the problem was ‘solved’, and the rate of bank failures has actually increased. In contrast, there were only 25 bank failures in 2008, 3 in 2007, none in 2005 or 2006, and only 22 from 2001 through 2004.